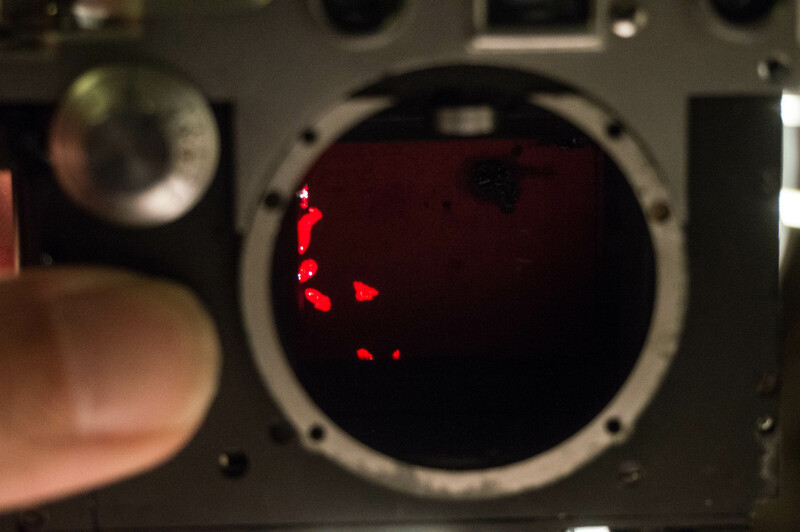 Red Shutter Leica: To Repair or Not to Repair? 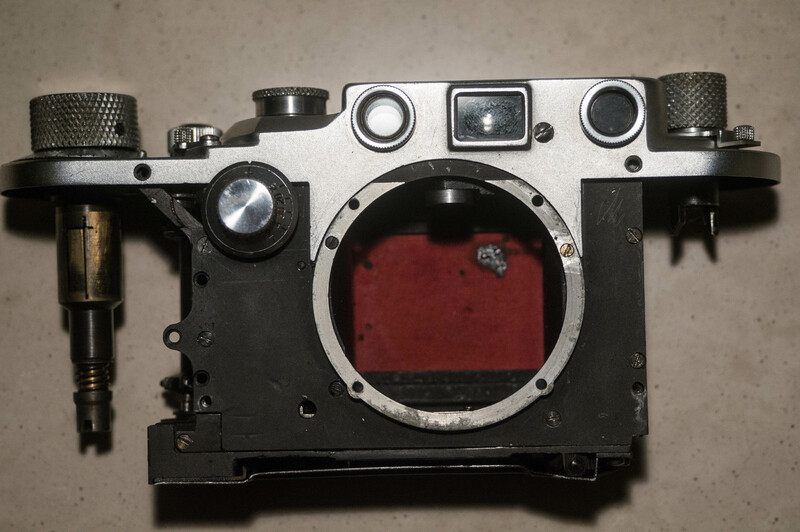 Hundreds of dollars spent on a collectible vintage Leica, and it doesn’t work. What to do? Naturally, take it apart! This is the camera I picked up on eBay. 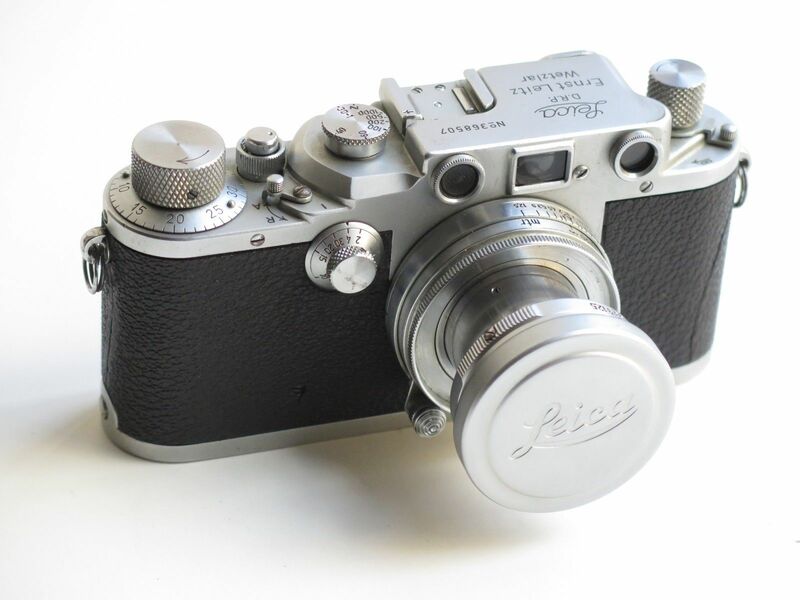 it’s a Leica IIIc, made in 1941. I thought I’d gotten a pretty good deal – my McKeown’s guide lists this particular model as being worth $300-$450, and the lens is maybe another $80. This particular camera is not in ideal shape – the covering is cracked and coming off, the lens aperture adjustment is pretty gummed up and hard to work – but otherwise it looks pretty good, especially considering that cameras of this time frame often have chrome issues due to wartime shortages in Germany at the time. But it represents some of the finest workmanship in camera manufacturing, and I was excited to run some film through one. But what makes this particular camera special is the shutter. It appears that serial numbers 362,401 thru 379,225 were produced with either one or both shutter curtains made from some sort of mystery red cloth reputed to have been an experimental material received from Kodak. The Leicas use a shutter made of two pieces of cloth that move from one side to the other when released, and the space between them (based on your shutter speed settings) is what allows the film to be exposed to the light. During the war, Leica apparently used this red material until they ran out of it, and then switched to black parachute cloth. Later, when owners would turn their cameras in for repair, Leica would replace the shutters for some reason. So of the 14,000+ cameras made in this way, relatively few survive today. Consequently, the value goes up to $600 or more. 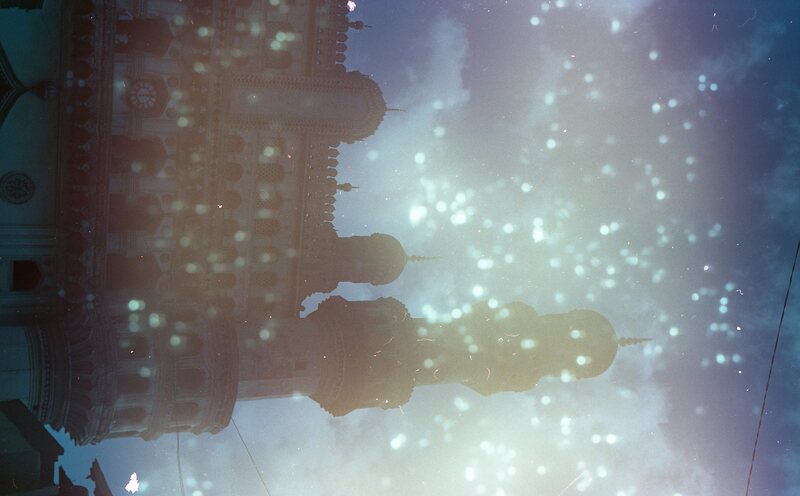 The cool thing about buying old cameras of this quality is that they retain their value. So you can buy one, use it for awhile, and if you get tired of it, sell it for what you paid (or more). Needless to say, Leicas that take pictures like this tend not to retain their value as much! Having paid $400 (I’m guessing you were wondering), I went back to the seller, who had claimed the shutter was operational, and we negotiated a partial refund of $100. It’s hard to say what’s fair – but I’m guessing that, accurately listed on eBay, the camera would have gone for no more than $200-$300, purely as a “shelf queen” collectible. I was surprised to see, when I flipped it over, that it appeared someone had already tried painting some sort of black substance over the back of the curtain, and it had flaked off in several places. Also, some parts of it scraped off sort of like wax – almost semi-liquid. It looks like black paint. And the forward-facing side of that shutter is cream/manila-colored, just like the other shutter (where the black paint has peeled off) and someone appears to have attempted daubing paint (?) on this side to repair pinholes as well. 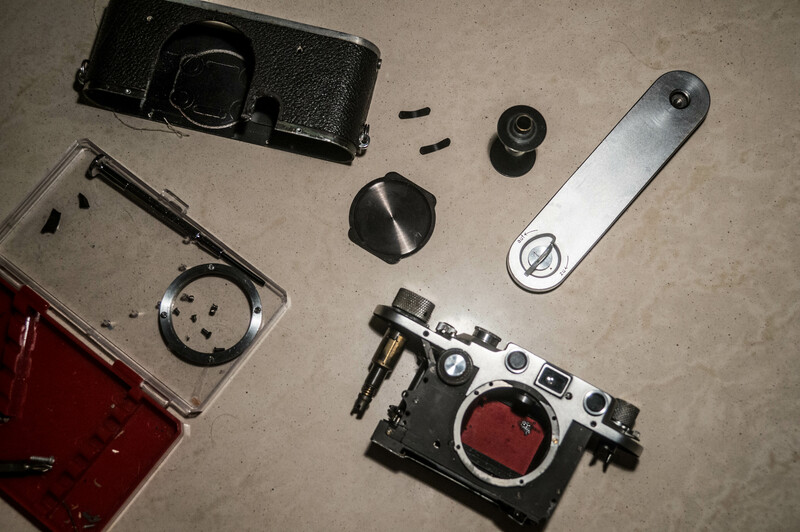 The good part about taking apart a Leica IIIc like this is it allows you to shine a light through the shutter, and really see just how much is reaching the film when it should be fully covered. 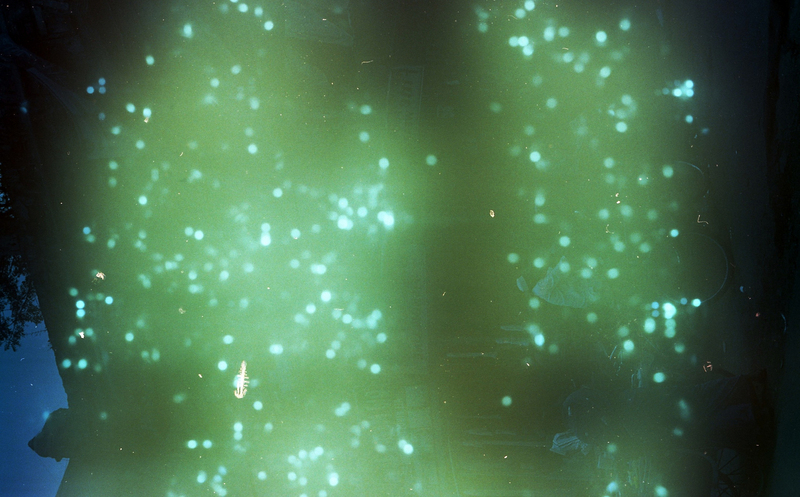 The first photo is the shutter curtain that shows when the camera is not cocked – the repair job that was previously attempted appears to have worked, as light only gets through in the places where it has flaked off. So maybe a touch-up with a similar substance would do the trick? The other shutter curtain, however, was in horrendous shape – and fully explained why I had gotten the pictures I was getting. I include another photo below for reference, with the contrast amped up a bit so you can see the areas where light is being let through more clearly. 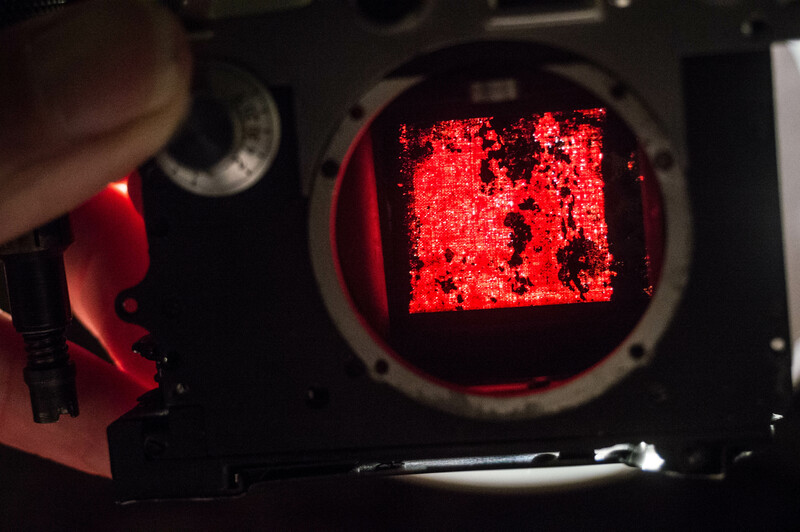 After a bit of rotating and flipping to get the image to be aligned the same as the shutter, you can clearly see that the red cloth and the black paint, or whatever it is, do a pretty effective job blocking the light. So the big question is, if I paint only the non-red side of the shutters (and let them dry/cure properly), can I preserve (somewhat) the “collectible” nature of the camera, while making it actually usable? Am I increasing or decreasing the value of the camera? I think painting over the red part would be a shame, but I want to make sure all the pinholes are properly sealed. So the material I decide to use will be key. If you’re interested in how this turns out, stay tuned – I’ll follow up once I’ve taken a stab at this and put it back together. 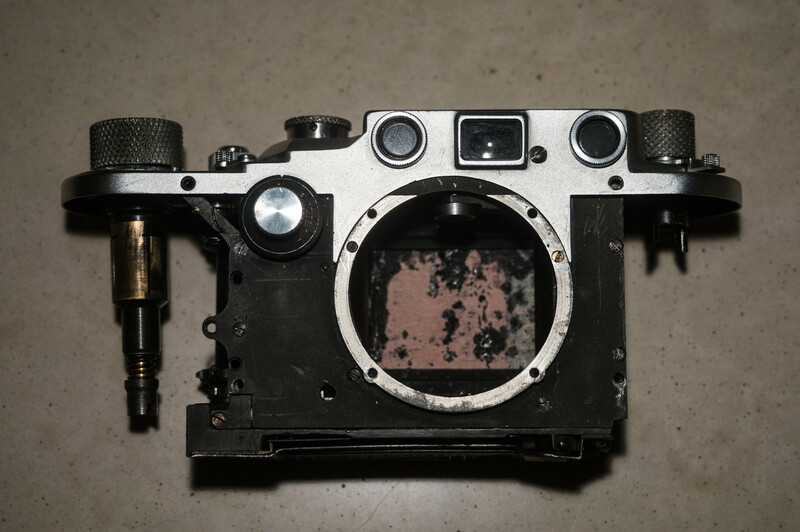 This entry was posted in Tips and Tricks, Vintage cameras and tagged damage, diagnose, disassembly, IIIc, Leica, pinhole, porous, red shutter, repair, wartime. Bookmark the permalink. 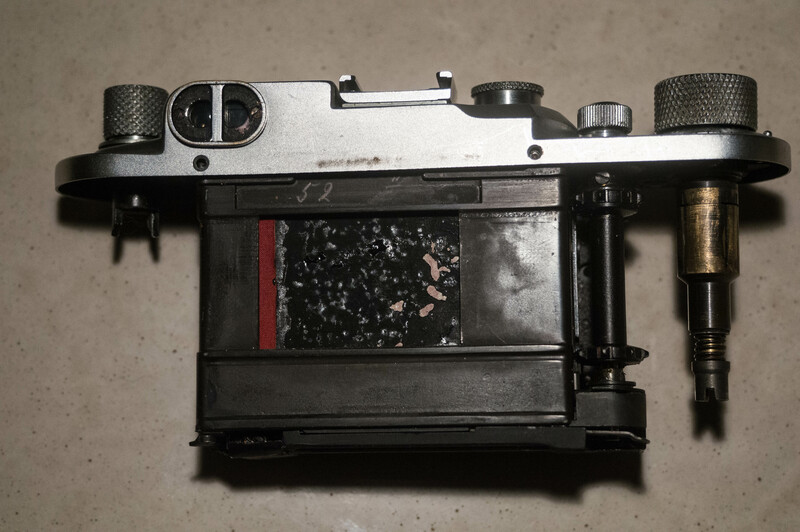 6 Responses to Red Shutter Leica: To Repair or Not to Repair? That is a mighty ambitious project you are undertaking – Not sure where I recommend going with it – but my suggestion is that learning to repair a Leica is best done on one that is not as rare as this one, and you should simply stabilize the situation and either hang onto it as-is holes and all or keep on the shelf. My guess is that by the time you are done “repairing” it – it will have lost all of its “red curtain” value. And – Dad has one similar to yours from a Poker Game in Korea in the 1950’s that I used through high school and college taking pictures (bought a Canon AE-1 in about 1981 to use after I had money). The Leica worked fine throughout except for some curtain creep in long exposures, and took sharper and better defined images than most digial cameras do today. Hmmmm….that’s exactly my conundrum. I wasn’t going to mess with it, for exactly the reason you mention, until I saw that someone had already attempted a messy repair job. I feel like on the shelf it will just be a waste of space, but I’m not going to attempt it without trying the sealant on other pieces of cloth to ensure I find something with no bleed-through. Or maybe not! I’m still not sure…. I had a similar but a significantly less drastic with my Canon IVSB (Leica screwmount copy). 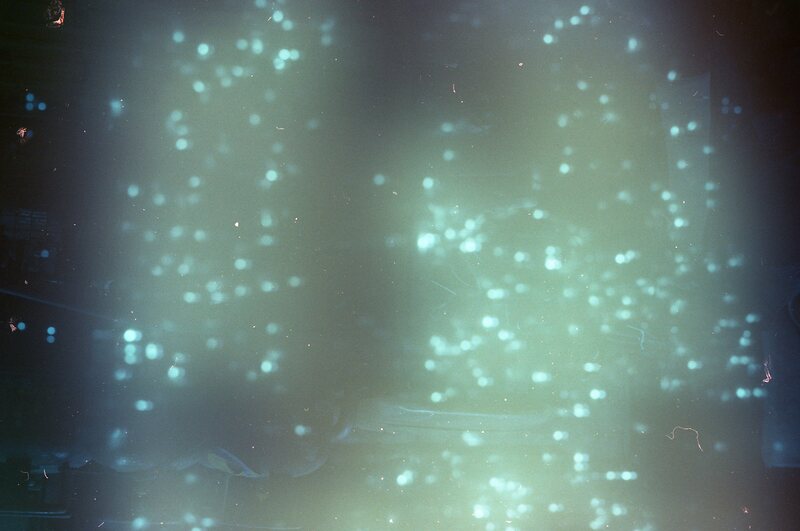 The curtain had about 10 tiny pinholes that I was able to fix using Liquid Electric Tape (liquid rubber in a jar). There is a guy out in MA that fixes this Leica type with brand new curtain. He quoted me $210 for my camera (not including shipping). Like I said, I was able to fix my curtain, but if the cloth goes bad again, I will send the camera to him. Word on the street that he’s the best and reasonably priced. I say it’s worth it. Leica came out with a titanium curtain instead of the cloth to prevent sun burning ( never point a rangefinder with cloth curtain at the sun. Think magnifying glass and ants) I never asked Youxin Ye if he does titanium replacement curtains and if so, how much. I would email him for a quote. He also CLA’s these camera as well. BTW: the lens is worth way more than $80. Think closer to $200 and more if in good condition. Thanks a lot for your feedback and the tips! 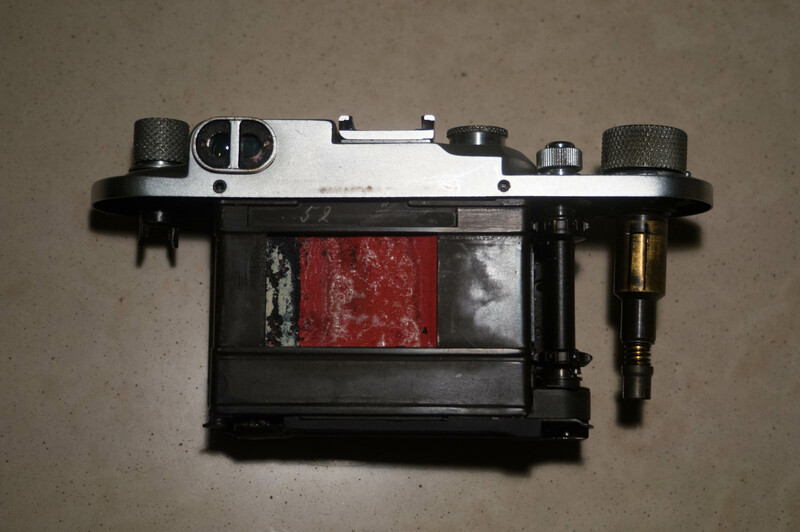 I have done the repair in such a way that the red shutter cloth, which increases the collectible value of the camera, is not visibly affected. 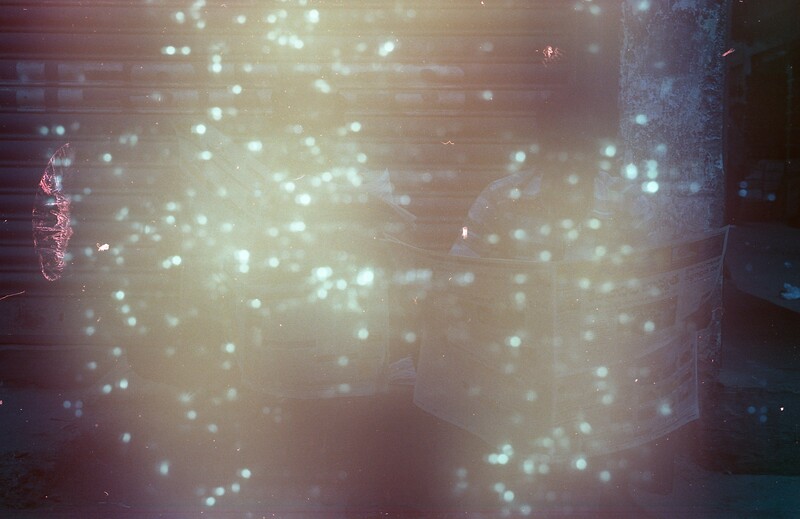 I have done a couple of rolls and it is now light tight, but I think the additional rubber may have affected shutter speeds. Or else there is a lens problem, not sure. In either case, the pics are all kind of dark and muddy. Will do another roll and post an update, maybe somebody will have some ideas. Otherwise i will try your guy when i am back living in the States. Thanks again! In 1966 in Holland, I paid what would have been around $40 for a red curtain Leica IIIc without lens. It also had some tiny holes in the curtains. During that time, the Russians were selling the FED Leica copies. They supplied me two new black curtains for free that were exactly identical in size. It is surprising how simple it was to replace these. I also found a nice Canon IV-S around 1968 in Canada with a cloth shutter problem. Canon replaced it with a metallic version. It still works fine. I wasn’t collecting. I just wanted to use these cameras. I’ll look in to trying to get black curtains. Ultimately using the camera is what it’s about, and the more I think about it, the “rarity” value is not really valid, given the attempted repairs! Thanks for your feedback. Make Your Own 3-D Camera!